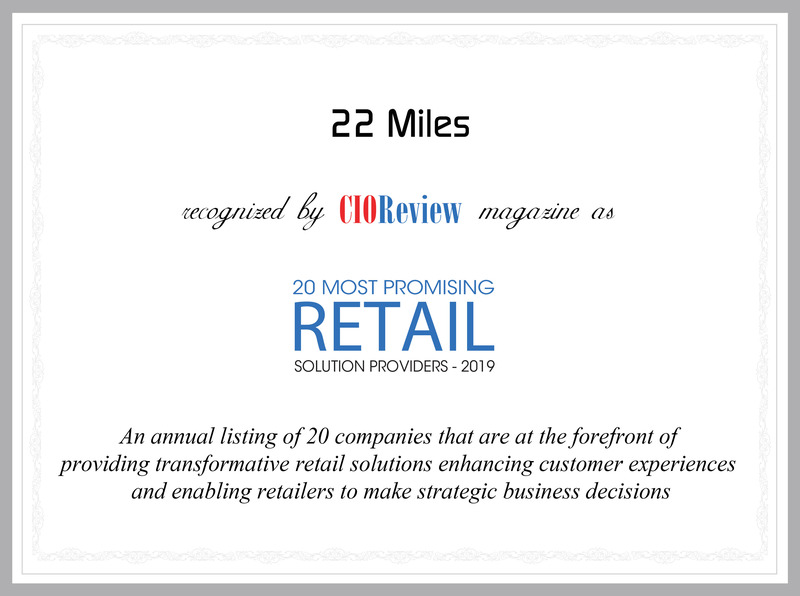 We are ecstatic to be featured as a top 20 Most Promising Retail Solution Provider in 2019. This is the second time we have been featured as a top 20 solution provider. Last year (2018), we were featured as a Top 20 Digital Signage Solution Provider. 22MILES has worked hard to bring innovation to the forefront of digital signage technology. We’re continuously developing new features and better user experiences to disrupt the current digital signage market. In 2018, 22MILES turned their attention to the retail industry. With a heavy focus on bettering store experiences, 22MILES developed Carry2Mobile™. Carry2Mobile™ uses HTML5 technology to seamlessly transition the user experience from a digital sign to a mobile device’s web browser. Motivated by user feedback and market research, 22Miles, Inc. was determined to empower the digital audience to experience content on a mobile phone with no App download necessary. In result, this new capability benefits both the display owners as it leads to higher usability and the end user as it is now much more seamless to consume content on the go. Shoppers today have a higher sense of urgency for quick purchases, access to promotions, and desire to have a more thoughtful shopping experience. They want to know where to go, what the best deals are down the aisle, and how they can avoid the long check-out lines. 22MILES’ HTML5 solution from any screen to the Carry2Mobile™ facilitates the kind of experiential and intuitive shopping that drives bottom-line sales. Any retailer from big box to QSR can provide real-time and dynamic information to their shoppers on the go. Additionally, enabling access to a user’s mobile device allows for a more personal and curated message and experience for shoppers of all demographics. Carry2Mobile™ will display the promotion, provide custom content through the web custom app design, and drop items into a digital cart instantaneously. Are you interested in how 22MILES can benefit your retail business? Request a demo today!